As I’m sure you’re well aware, there are many wildlife organisations based around the globe; some that are doing amazing things for the animals of our planet, and some that use them for their own selfish gain. Situated just outside the capital of Nairobi however, is one of the most heartwarming wildlife organisations I’ve ever been lucky enough to experience; the David Sheldrick Wildlife Trust. This organisation completely exceeds its duty and sits on top of the cake for their amazing, constant work in protecting Kenya’s wildlife. I had known about Sheldrick’s work for years before I finally got the chance to visit, but what I experienced at this elephant orphanage was far better than what I could have possibly imagined. To be completely honest, I was desperate to visit Nairobi simply so that I would have the change of visiting David Sheldrick Wildlife Trust. The idea to visit this part of the world was driven by the fact that I had been fostering an elephant with this organisationg for nearly 2 years, and I really wanted to meet her! Finally, in September 2017, I made it! We arrived in Nairobi, Kenya at 9 pm on a Sunday night, and on Monday morning we were on our way to the orphanage. You can probably gather that I was pretty keen… Before arriving, I knew that this place was very popular amongst tourists, but I was very surprised to see just how many people were lining up at the gates. For those that may not know about visiting Sheldrick, the orphanage is only open for 1 hour every day – between 11 am and 12 pm – and I was very very very excited to enter. Just as the other 50+ people were too. It was founded in 1977, by Dr Dame Daphne Sheldrick, in honour of her husband who sadly past that same year. She had worked alongside David for over 25 years; where they raised and rehabilitated many wildlife species from a variety of different circumstances. Since her husband’s passing, she and her family have continuously lived and worked in Nairobi National Park where they built the David Sheldrick Wildlife Trust and the famous elephant orphanage. Aside from the orphanage, the organisation has committed to the following acts – Conservation, preservation and protection of wildlife aka. anti-poaching, safeguarding the natural environments, addressing animal welfare issues, providing veterinary services to wildlife in need and enhancing community awareness. They basically take everything that needs to be done and do it themselves… And that’s a pretty amazing thing! 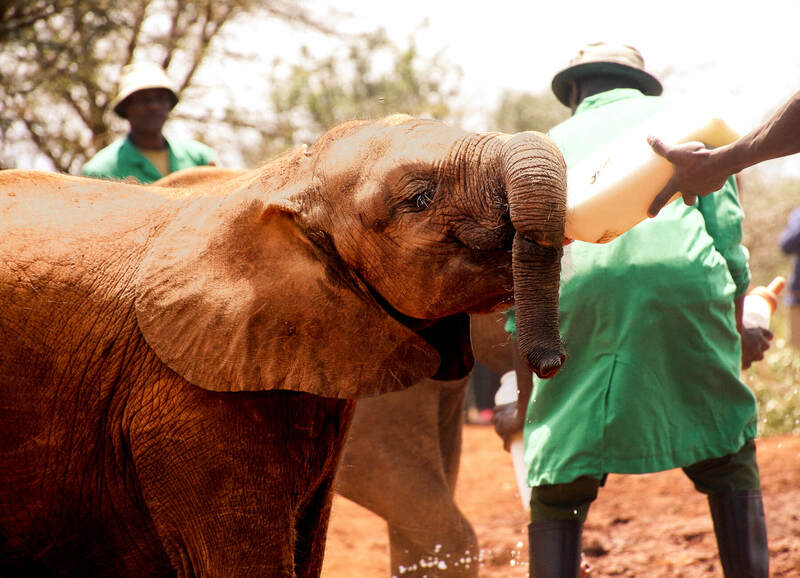 During this one-hour period that the orphanage is open to the public, the team at David Sheldrick treats the visitors to the mid-day feeding and mud bath. The 29 elephants that are currently being raised by this organisation are split into 2 groups: the younger elephants, and the older. To begin with, the tiny elephants run out of the bush in small huddles; they run towards the keepers with their trunks in the air, ready for their bottle (one that’s about 50x bigger than what you’re probably used to might I add). Daphne Sheldrick has been highly recognised as the first person to have perfected the milk formula for hand-rearing milk dependant elephants and rhinos – which was pretty obvious by the ways these little babies were reacting! They were adorable… Some a little more eager than others, but in general, it was an experience I’ll never forget. Once the younger calves had consumed their mid-day snack, they were then left to their own devices to eat the hard feed that was scattered around the area, or to play in the big mud pool. The one thing that I really loved about this experience, was that it was made very clear that these animals were to be treated exactly as they originally were… Wild. Loud noise was to be kept to a minimum, and you were only to touch the elephants if they decided to come to you. Throughout the entire process of hand-raising the elephant, the end goal for the keepers is for the calf to be reintroduced to a herd. So making sure that these elephants don’t become dependant on humans is their main priority – along with saving their lives of course! 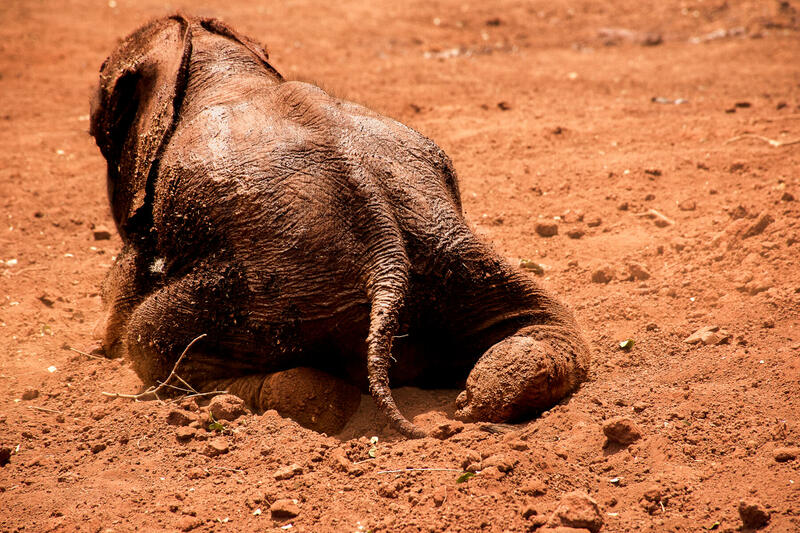 Whilst the elephants enjoyed bathing in the mud, causing havoc or relaxing in the sunshine, Edwin (the Project Manager) told us a lot about the work at David Sheldrick. We were informed about every elephant in their care; their name and their reason for being in the orphanage. It was heartbreaking to hear the sad circumstances that these animals had been faced with. Many enduring hardships that I couldn’t possibly imagine; being caught in snares, fallen down man-made wells, suffering from dehydration, family killed from poaching or caught in human conflict. As some of you may know, there’s a saying that “an elephant never forgets” – and that’s sadly true. These poor babies have had to endure many hardships that could easily be resolved with education and compassion by mankind. They will remember the traumatic experiences they have faced for the rest of their lives, just as humans will always remember their own. Human destruction is sadly leading these animals to the brink of extinction, but thanks to the people at David Sheldrick, these elephants have a flicker of hope. So once we’d seen the young, they were ushered back into the bush where the keepers were awaiting, and the older elephants came out to play. The exact same process was taken, and we learnt about each individual orphan and how they were being cared for at David Sheldrick. We learnt that the elephants start to slowly be introduced into a wild herd from the age of 3; they’re relocated to the rehabilitation units in Tsavo, where the elephants are still cared for by keepers but have the ability to socialise with ex-orphans and other wild elephants too. As the elephant becomes less and less dependant on milk, slight changes start to happen in their routine. Many will mingle with the other wild elephants during the day, but will return the stockades to sleep in the evening. Only when the elephant feels ready will it stay out with its friends and be officially rehabilitated! The process in Tsavo generally takes a few years but is personal to every elephant, it’s taken at a pace that suits the individual animal’s needs… Which is a pretty special thing! From this viewing, it became very clear to me just how much love, care and patience it must take to look after these creatures. It may seem like a dream job for some… But as I learnt later that evening, it’s not for the faint-hearted. After one hour of pure joy, the animals were taken back into the depths of the National Park where they were to spend their day with the keepers being somewhat wild and free. For the majority of the group, that was the end of the David Sheldrick experience… But for crazy animal lovers like me, the best was yet to come! As I said earlier, visiting David Sheldrick Wildlife Trust is available to the public every day from 11 am – 12 pm, but also in the evening from 5 pm – 6 pm. However, this evening viewing is only for those that foster an elephant at the orphanage. It’s a viewing that is a little more private, with fewer people and a more personal encounter with the animals. It’s a viewing that must be booked in advance, and can only be seen by those that have already got a foster elephant (and a certificate to prove it) or have organised to foster one during their booking. Since I had been fostering my elephant “Malima” for a little while now, there was absolutely no way I was going to miss out on this experience. I headed back at 5 pm and experienced the cutest thing my eyes had ever seen. At 6 am every day, the elephants head out into the Nairobi National Park with the keepers, and 5 pm is bedtime! At this time, all the elephants come back to the orphanage where they nestle down for the night. They each have a personal stall, with food and water ready for them – and for the very young elephants, there’s a bed for the keeper in there too. In small groups, the elephants ran in from the National Park; they came in single file, in a very orderly fashion and headed straight into their own stall – proof that elephants are pretty damn smart right? All of the foster parents (or soon-to-be foster parents) watched all of the orphans run in from the bush, waiting for them to enter their bedrooms and then we were free to explore. For those that already had a foster, this was the time in which you could find your elephant, see them in their pyjamas and have one on one time if the elephant invited you to. If you were yet to foster, this was the time that you could pick your elephant and you weren’t to leave until you had paid for your application. Unfortunately for me, my little Malima was a little shy, but that certainly didn’t matter as I completely understood that human interaction isn’t what all animals desire. As for the elephants that wanted to play, you were not allowed to enter the stall and you had to remember that the elephant is not here as a tourist attraction. They’re here to be hand raised and to learn how to be wild again – the only people allowed inside were the fantastic keepers. The very young babies had an enclosed stall. Inside was a bunk bed in which a keeper sleeps to make the elephant feel safe and to give them their bottles during the night. One keeper said that every 3 hours, a little trunk comes up to wake them up for their milk. Pretty cute right? What I wasn’t completely aware of before entering, was that there are more than just elephants here at David Sheldrick… Currently at the orphanage, there is also an 11-year-old Rhino who is completely blind. He was rescued at the age of 3 months, and surgery was undertaken to try and regain his vision. But sadly his lack of sight was due to natural causes and the problem was unable to be solved. He would never be able to survive in the wild as rhino’s need to defend their territory, and that would be a little difficult without any vision. The team did their best to help him, but Maxwell’s home is now with the lovely people at David Sheldrick. They also have a baby giraffe too, whose mother was killed in a snare. Kiko is luckily due to be released very soon! So as you can probably gather, David Sheldrick Wildlife Trust is a place that is worthy of every high praise. I’ve never left a wildlife organisation feeling more empowered than I had when I left here. Everything from the incredible staff, to the orphanage grounds, all the way to those beautiful little elephants completely warmed my heart. Altogether, this orphanage has successfully hand raised over 150 elephants – That’s 150 elephants that have suffered from traumatic experiences influenced by mankind. This is the is the simplest way to save the lives of wildlife around the world, and specifically in Africa. Don’t buy products that contain the parts of an innocent animal – It’s easy! For as little as $50 USD a year you can foster your very own elephant! You’ll have access to year-round evening viewings at no extra cost. You’ll receive an adoption certificate, monthly updates on your elephant’s progress, and a watercolour painting from Angela Sheldrick. A lot of money is needed to raise an elephant, and it’s up to us to support this amazing organisation in doing so. The more money they raise, the more elephants they rescue and the more awareness they spread on the damages of ivory poaching and wildlife destruction. Education is key – Spreading awareness on issues like this only brings more positive attention and change. 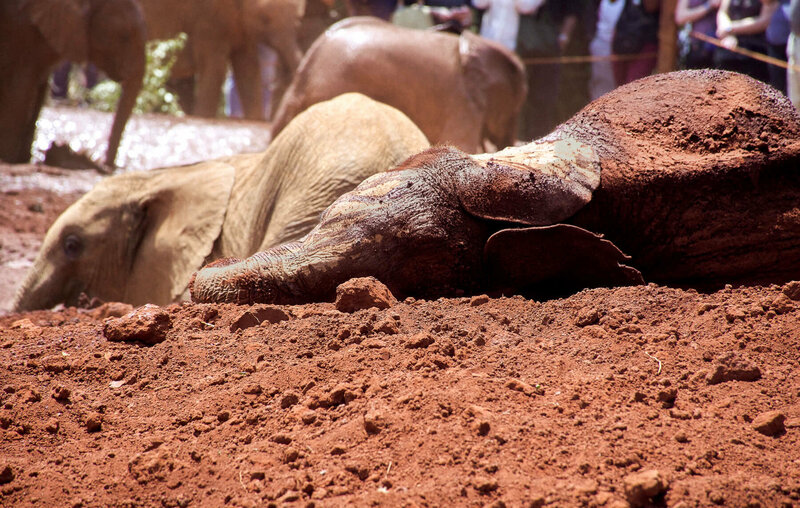 We don’t want any more elephants to experience hardships like those at David Sheldrick today. So all in all, I visiting David Sheldrick Wildlife Trust left me with a very full heart. Not only because I saw the cutest baby elephants on earth, but because I finally have faith in mankind. With a little more education, I really do believe that humans and wildlife will one day be able to live in harmony. We could all learn a lot from the team at David Sheldrick; fighting for the lives of these beautiful, innocent animals is something to truly be admired ? Is visiting David Sheldrick Wildlife Trust something you want to do? Have you got any foster animals? Let me know below! Looks like such a wonderful experience! I like that people are not allowed to bathe the elephants, but the least contact possible is encouraged!! So important to make sure people realise that these are wold animals – I’ll remember this place for when I finally get myself to Kenya!! very cute post. We are fostering Malima too and try to visit her and DSWT in November. On which pics is Malima in your post, all of them? That’s amazing Alex! It’s such an incredible place, I hope your visit fills your heart as much as it did mine. Malima was a pretty shy elephant so she was a little more difficult to capture with the crowds. You can see her in the image where she is inside her stockade facing away from the camera eating a tree branch, and also in the image directly above it where she is running on her own! Oh! this is true happiness and freedom!! like in the beginning of the world… incredible and beautiful!!! THANK YOU !!! The pictures were gorgeous as always. It saddens me to see such plight of beautiful and intelligent animals but I am glad to see that they are being taken care of. Humans can be so cruel, but it was amazing to see such an amazing organisation fighting against the destruction.